Rating: Average 4.65 / 5 out of 17 total votes. Summary: Fushimi Inari has a hopeless crush on her classmate Tanbabashi. One day, while trying to interact with him, she accidentally humiliates him in front of the whole class. He refuses to accept her apologies, and to make matters worse, she discovers that he probably has a crush on their incredibly cute classmate Sumizome. She has all these things in mind when she is summoned by Uka-no-Mitama-no-kami, a pale fox goddess. In return for rescuing a little fox-spirit creature before school that day, the goddess offers to grant a single wish of Inari's. Without thinking, she blurts out that she wants to be Sumizome. As one might expect, this wish does not go nearly as well as Inari had hoped, and the kindly goddess breaks a goddess-rule to give Inari the ability to change herself back. Now, Inari can change her own shape at will, and using her new skill is very tempting as she keeps trying to win Tanbabashi's heart. 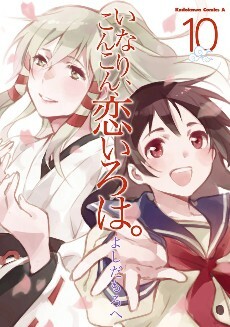 But if Inari flaunts her ability, both she and the goddess might end up in trouble with Amaterasu! Alternate Names: いなり、こんこん、恋いろは。, 稻荷恋之歌, Inari, Konkon, Koi Iroha.